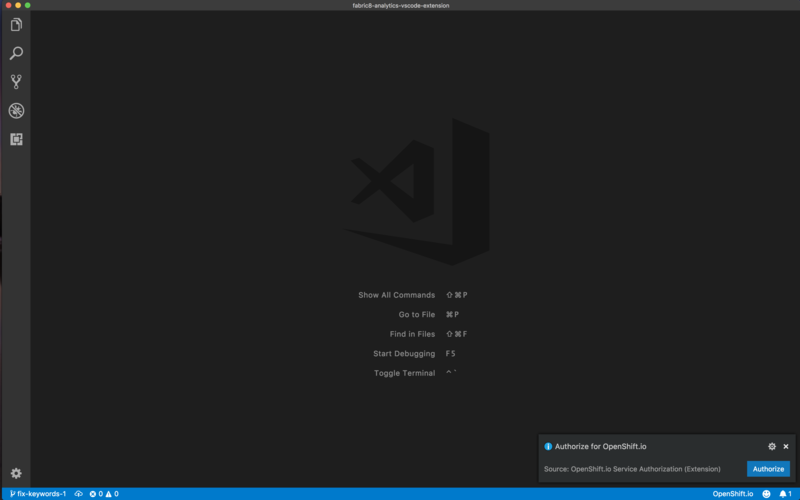 Visual Studio Code>Other>OpenShift.io Service AuthorizationNew to Visual Studio Code? Get it now. Red Hat OpenShift.io is a highly collaborative open-source, web-based application lifecycle management solution. It is a next-generation product for developers to seamlessly manage end-to-end application development. The OpenShift.io Service Authorization extension enables authorization of OpenShift.io services from VSCode. Install the Extension. Note that if you install the OpenShift.io Services extension it will automatically install the OpenShift.io Service Authorization. Authorization is activated when you open a workspace. Install the dependencies: npm install. Start the compiler in watch mode: npm run compile. Open this folder in VS Code and press F5.